Did you know that 80% of the world’s population has an iron deficiency, and 30% may be experiencing anemia? Many of which are women. I didn’t know about this either until I read about it on Spatone Pur-Absorb. I’ve always experienced some form of iron deficiency throughout the years. While I was pregnant with my children, the Doctor’s prescribed iron pills in addition to prenatal vitamins. I fell into the 30% bracket with anemia. On occasion, I continue to struggle with my iron levels. Naturally Savvy had contacted me and asked if I would like to sample the Pur-Absorb Iron water. I graciously accepted the offer. I don’t normally consume iron as a solo vitamin anymore due to the uncomfortable side effects. Pur-Absorb Iron water is 100% natural, and a lower dosage. This product claims there are less side effects when taking the water. After doing some research, I had no reasons not to accept. The package arrived safely with no damage to the contents inside. I was taken by surprise when I opened the package to find that the packets are filled with liquid. I don’t know how I missed that when researching the product. I assumed they would be in powder form. Not a problem! This just made it a little easier for me to try. There is a perforation on each individually sealed packets to make it easier for quick consumption. Carefully tear along the lines to expose the product. The first thing that I did was inhale the Iron water. I have a habit of doing this with anything from medication, food, to other products. Expecting this product to overwhelm me with an unpleasant scent, I was amazed to find no detection of a scent. Not wanting to be caught off guard by an awful taste, I slowly took a sip of the Iron water. This product does have a strong metallic flavor to it which is not unusual for any Iron supplement. While holding the packet upright, I read the box once more. It explained that this can be diluted with ½ cup of water or juice, with the exception of grape juice. This is just what I needed to read. I headed to the kitchen and poured myself a ½ glass of apple juice. After mixing the Iron water with the apple juice, I had no problems ingesting this product. The liquid went down quite smoothly with no metallic aftertaste. I can attest that this product has not given me any stomach trouble since I started using it. The ease and simplicity of the packets make this great for on the go. I’ll definitely consider purchasing this product again in the future. I would now like to close my blog post by quoting a few passages from the Pur-Absorb website. You can also read more about Pur-Absorb Iron Water in the Q&A section. When consuming a lower dose of iron like pur-Absorb, side effects often associated with conventional iron supplements such as constipation, stomach irritation or headaches become far less likely. 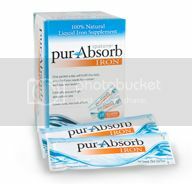 Each highly absorbable packet of purAbsorb will fulfill the body’s daily absorbed iron needs without having to excrete too much iron - often the cause of the unpleasant side-effects experienced with iron supplementation. DISCLAIMER: My personal thoughts and opinions on this page are my own and true. I received a sample of this product in exchange for sharing such opinions. I am not a health professional and hold no responsibility between you and the company/product. Please seek the advice of a medical professional before consuming any supplemental products.